Do you have a living room? Y’know, the room everyone loves to hate for it’s modern day uselessness. Maybe you use yours as a storage room for toys or perhaps it’s sitting empty with no furniture at all? While most people use the family room for the bulk of their daily living, that “other room” down the hall leaves many wondering why it’s taking up prized square footage. In our house, the living room is decorated in unabashed Country French style and I’m here to share with you why. Here are 4 reasons to use your living room. 1. A place to read Yes, of course you can read in the family room, but with the TV blasting and a swarm of phones and iPads broadcasting a cacophony of notifications, the living room is the ideal respite for peaceful reading. I love to relax in here with a cup of tea and a book. It’s also the spot where I keep the few hard copy magazines I still receive, in a rattan basket beneath a carved French end table. 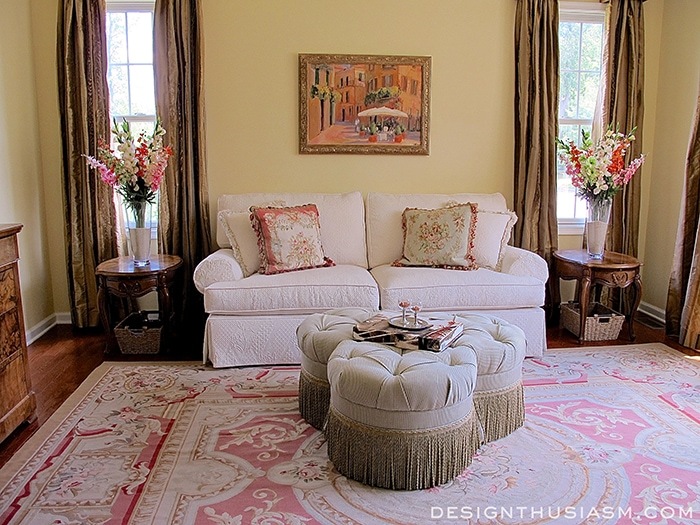 The tufted ottoman serves as a soft edged coffee table, a lovely place for drinks to rest. 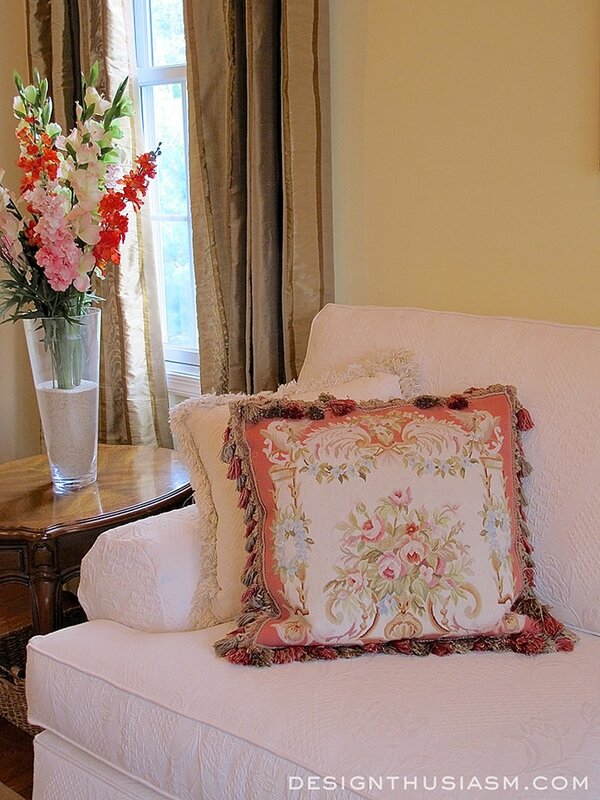 The tapestry pillows convey they French theme, while offering comfort. 2. Classic Storage While dishes and tableware are divided between the kitchen and dining room, and the family room entertainment unit is reserved for media and the like, the living room provides a safe haven for more traditional items. 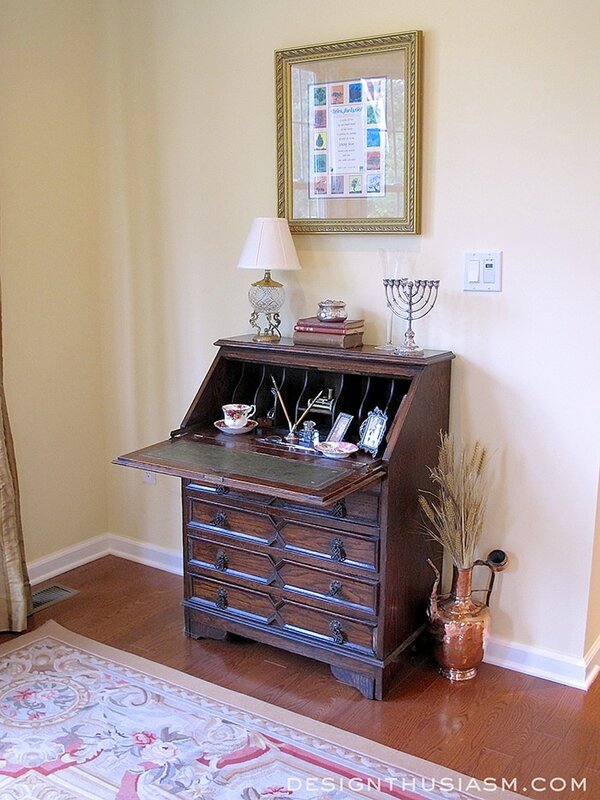 In this burled wood chest we keep table linens and other occasional items. 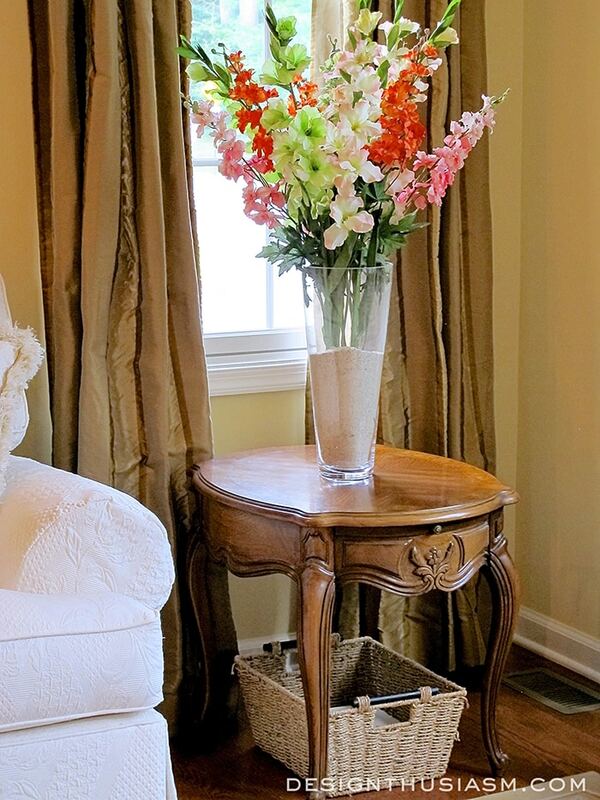 A balanced mix of soft and hard pieces keeps the room looking both classic and inviting. 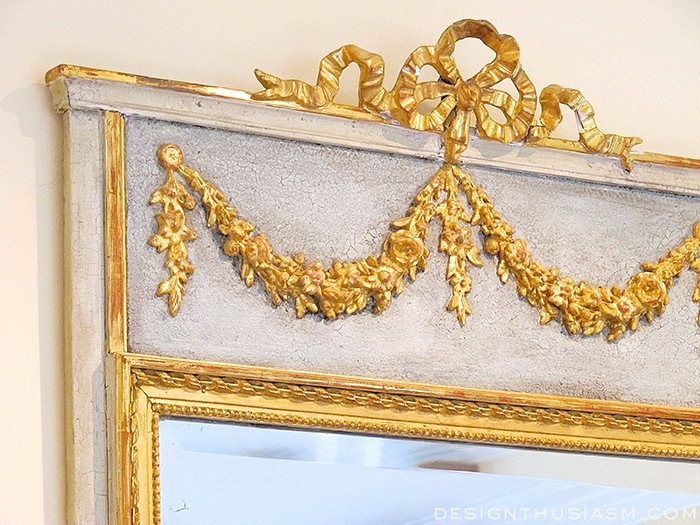 The French trumeau mirror sits regally above the bureau. 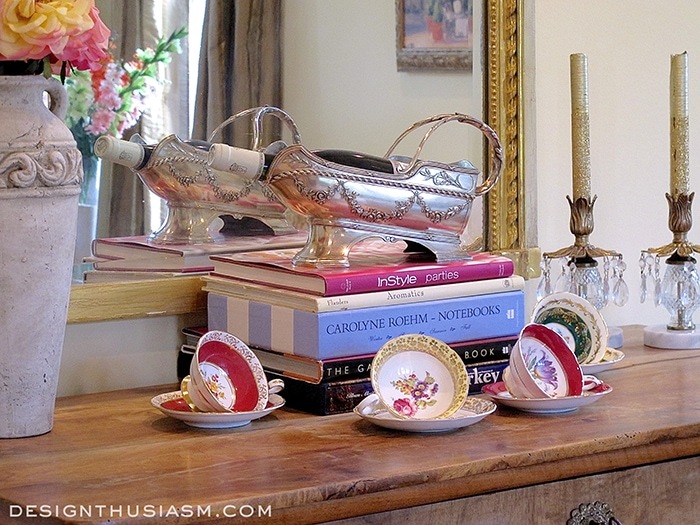 Teacups and wine caddy are waiting nearby, while glimmery candlesticks are ready to be lit. 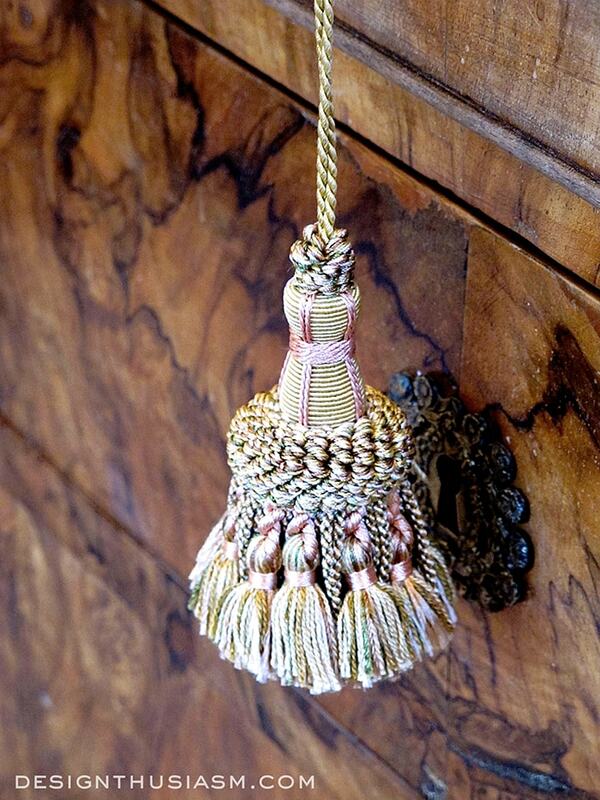 A simple silk tassel can make any drawer pull special. 3. Old fashioned conversation If you’re lucky enough to have the space, there’s nothing better than having dedicated sitting areas for separate conversations. 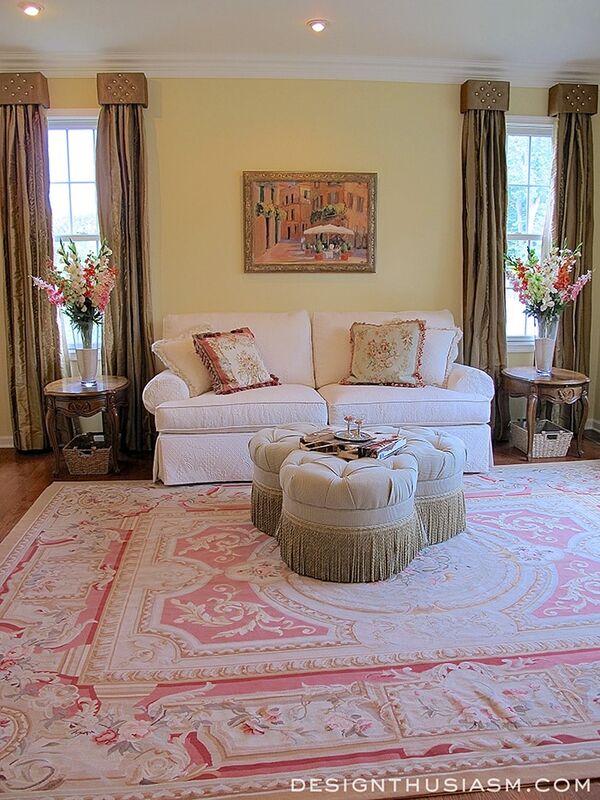 While many people use their living rooms as parking lots for spare furniture, a classic layout that encourages social gatherings is the ideal luxury. 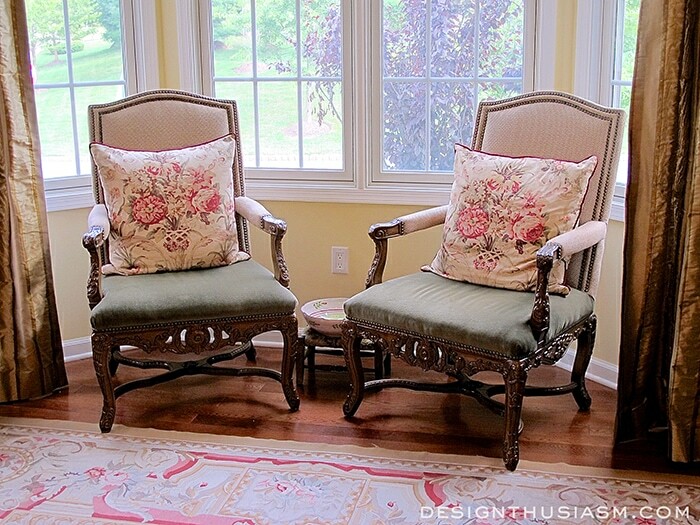 Deep plush chairs are tucked into the bay window alcove. 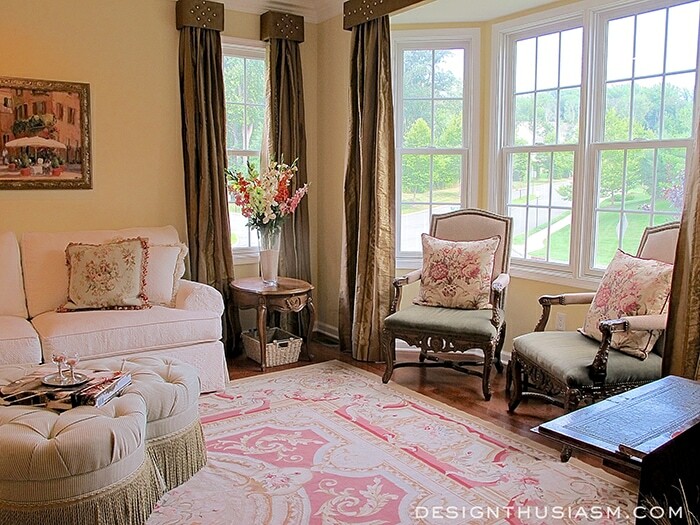 Silk drapery panels add a note of formality, while the generous windows bring in plenty of light. 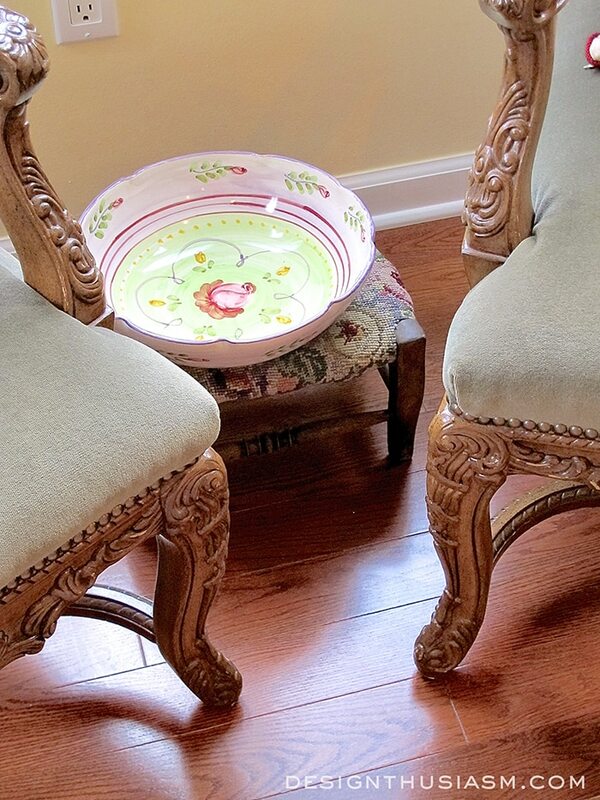 The tiny needlepoint stool hold a pretty piece of Italian pottery. 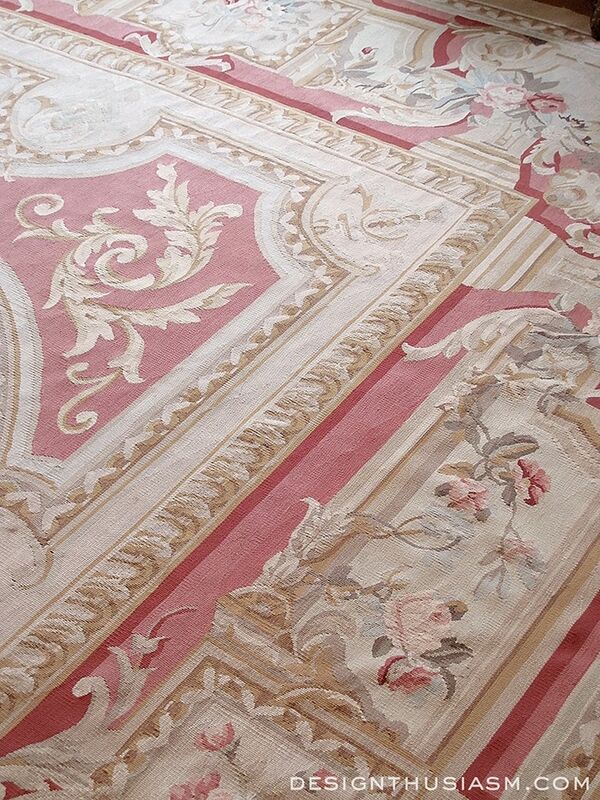 The French aubusson rug pulls the entire room together. 4. Writing notes and cards If you’re one of those people who emails thank you notes, you’re probably not longing for a formal living room. But for those of us that still send hand written notes when the occasion calls for it, the quiet elegance of this room lends itself perfectly for that purpose. 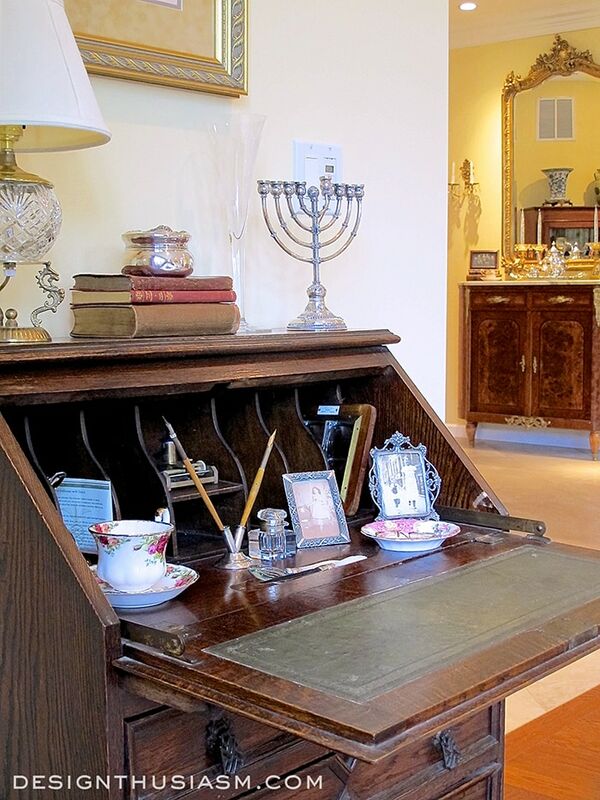 An antique English writing desk holds all the necessary tools, from personalized stationery and greeting cards, to stamps and writing instruments. This is also where I keep wrapping paper and gift tags, and other assorted papery. 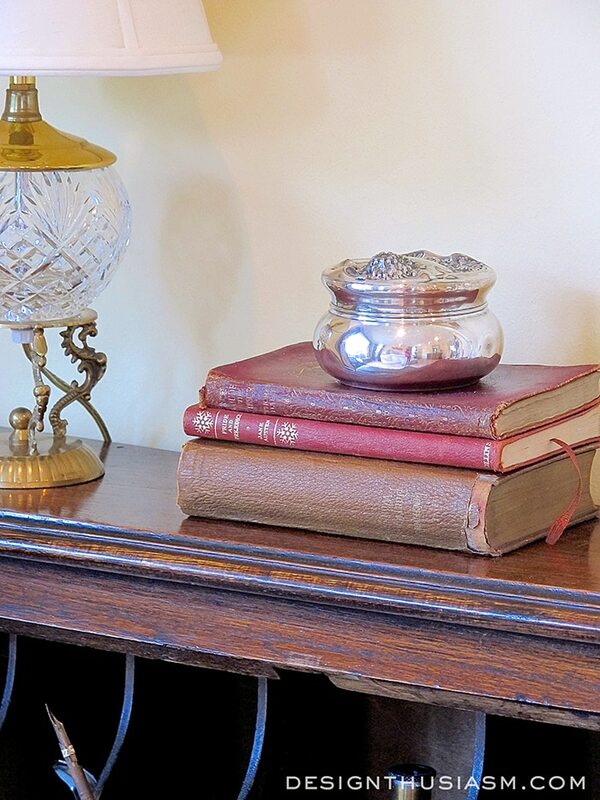 Vintage leather books help set the tone. 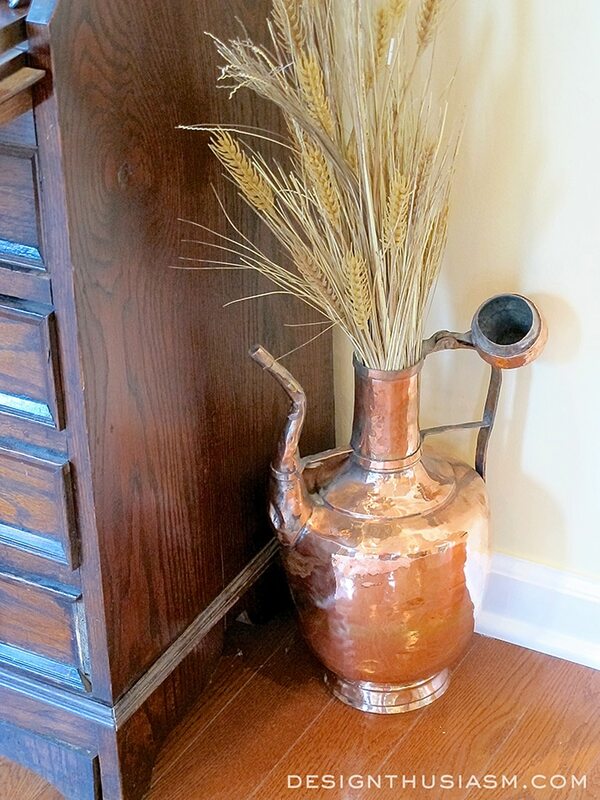 A copper jug adds warmth to the setting. 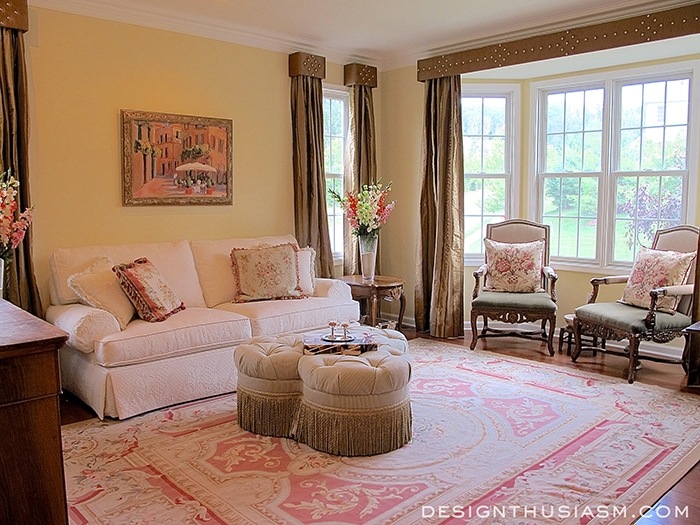 The soft tones of the room impart just enough color. If your living room makes you smile every time you walk into it, you will find countless reasons to spend time making use of it. 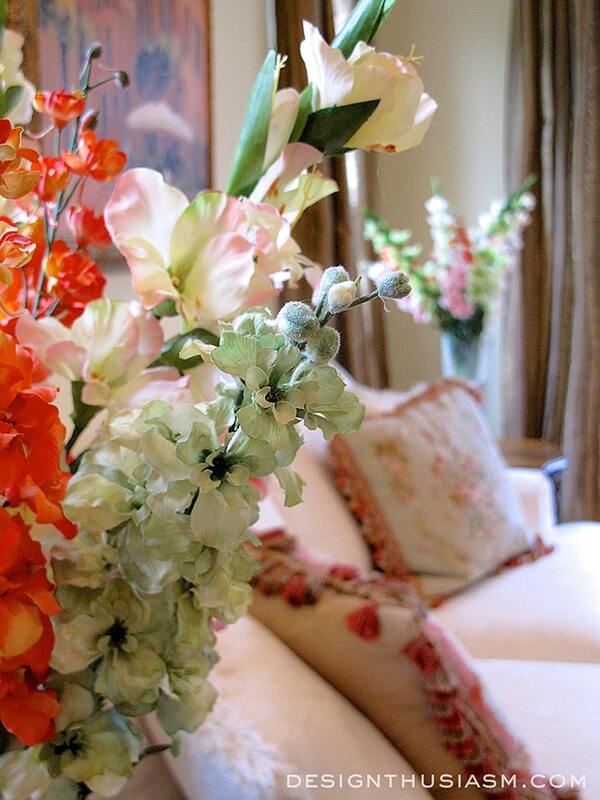 Another beautiful room Lory. Just love your style, and thanks for sharing. I could not agree more with the usefulness of seperate sitting/conversation spaces! We have a family room an a living room and use them both for different purposed as well as moods. Hubby and I have a lounge off of our bedroom, too, w/ a bar, table/chairs, and club chairs. 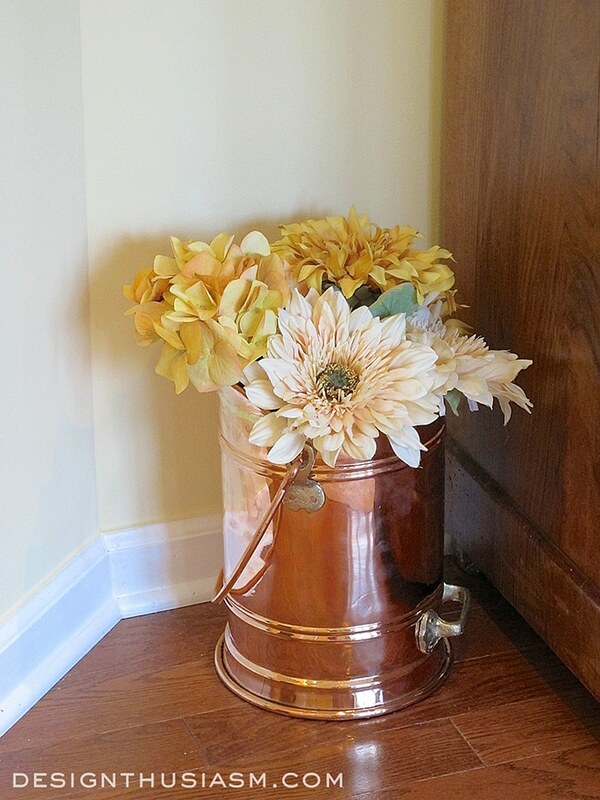 We use this all the time and it, too, creates a space for an entirely different mood. 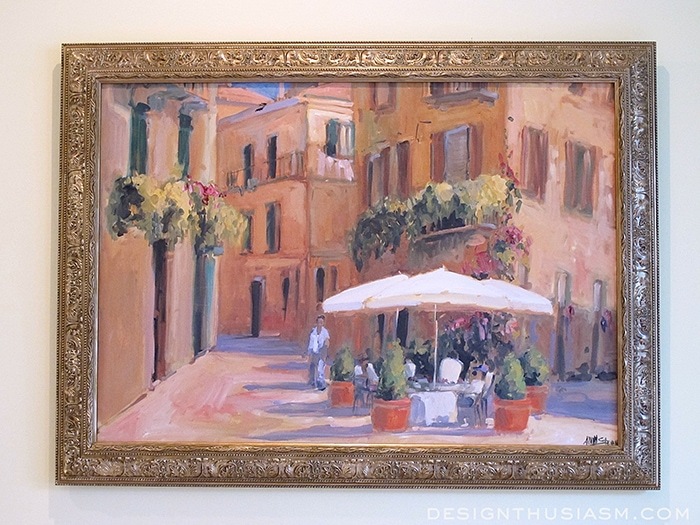 Before I had to give up a bedroom for a guess room, I had what I called a sitting room…. It was basically a mom cave…all pink and cute. (The rest of my house is far from pink.) It was on the second floor so it was mostly religated for me or my daughter or maybe a friend and me. Regardless, it was so sweet. I applaud the multiroom philosophy….hardily! I so agree, Robin. I’m a full believer in using every room in the house. In our old house, I used to follow the sun across the house, moving from room to room as the light shifted. Now most of my rooms get a fair amount of light but I’ve become used to working in the study in the morning, reading in the living room in the late afternoon and relaxing in the family room in the evening. Thanks for stopping by and taking the time to comment! In a world that has gone totally very white, it’s really a pleasure to see beautiful color again…. Lory, I LOVE your living room! 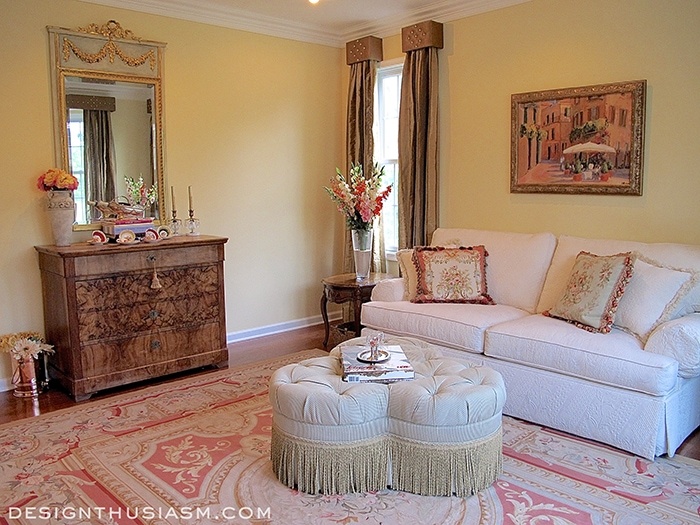 The pillows and rug are just my style, and that ottoman–oh, my! I think your home has just the right pop of color whereby you notice all the nice elements in the room…and it’s so nice to see color with so many going too neutral for my taste. I have three rooms separate from my family room that I love to just get away to and read or just look outside at different times of the day. I seem to gravitate to English and French Country so I’m incorporating those looks as we move forward with our remodel. We have a third floor attic room that is done in an elegant “fox hunt ” style and a second floor late 1800’s “golf room” den ( both masculine, but I love them… especially cozy in Autumn and Winter).Our master bedroom, with two caned-back upholstered chairs and a tea table sitting space, is an elegant French Country, will be a spring green with floral Aubusson pillows to satisfy my girly side. 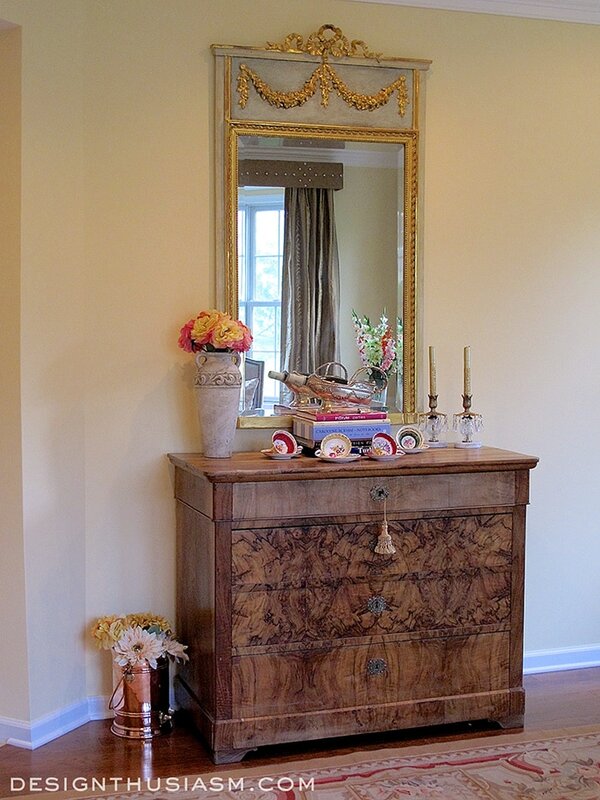 Our parlor and dining room are a mix of formal antique Chippendale and antique French pieces. I’m still undecided about colors there, but I’m thinking Light peaches with blues as we have several porcelain pieces in blue with that crackled grey-white. I love having nice uncluttered rooms, away from our “lived in” family room. As there are just the two of us now, we even tend to eat a lot of our meals in the family room, hubby does a good amount of at-home office work there, and all my decorating ideas seem to linger there in boxes, so I NEED that get-away space or I start feeling hemmed in with all the clutter that seems to be around half the time. Looking forward to more of your lovely reveals. BTW, where you live in NJ is such a pretty area. My Dad used to live up that way, in Randolph…built up now but it was still more rural in the 1970’s. The deer are overtaking that area as more and more development has taken away their natural habitat….sad. Your home sounds so lovely and right up my alley! 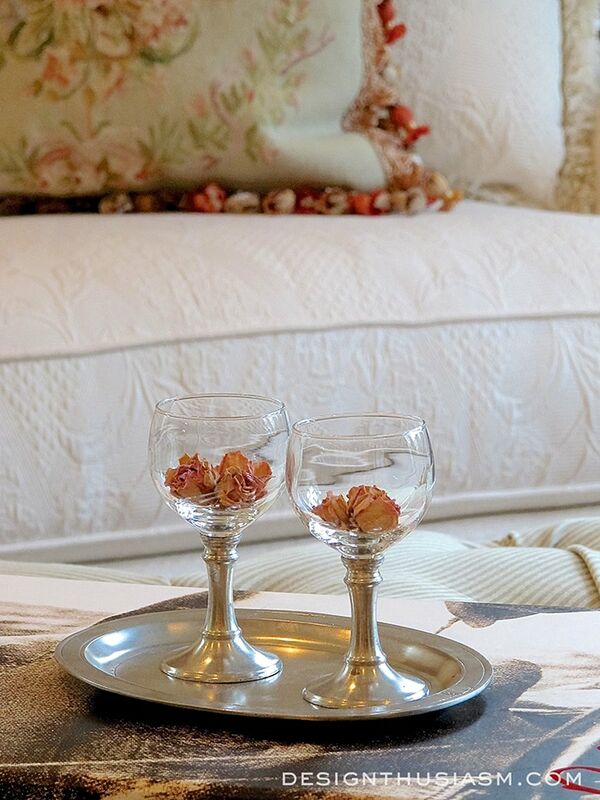 One of my very first design jobs was working for Ralph Lauren, way back in the 1980’s when he was just starting up his Home Furnishings Division. So much of my taste has been informed by that early experience, and I still think Ralph is the master. I’ve since added in the French influence which was likely a result of my travels but the styles work well together, I believe. Thanks for stopping by and adding such a detailed comment! “Tis a lovely room indeed! I have a LR that is telephone/television free…..only musical instruments allowed!! I do a lot of work there, but the cat and I like to loaf there as well. The room has a small wingback recliner….I flop down there and she flops down on top of me :^)…so much for the magazine reading! Where to get the gorgeous white matlesee sofa???? The sofa is from Ethan Allen.